Experience History Vol 2: Since 1865 8 Edition Connect students to the stories of history. Connect students to the experience of history. Connect students to success in history. At McGraw-Hill, we have spent the past few years deepening our understanding of the student and instructor experience. Employing a wide array of research tools including surveys, focus groups, and ethnographic studies, we've identified areas in need of improvement to provide an opportunity for greater learning and teaching experiences. Experience History is a direct result of this. Experience History is also a first in American History. Its groundbreaking adaptive diagnostic and interactive exercises paired with its lively narrative and engaging visuals create a unique teaching and learning environment propelling greater student success and better course results. Instructors gain better insight into students' engagement and understanding as students develop a base of knowledge and construct critical thinking skills. Gripping stories keep students turning the page while the adaptive diagnostics for each chapter and a personalized study plan for each individual student help students prepare for class discussions and course work while enjoying increased course success. 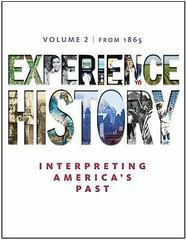 Experience History emphasizes that history is not just a collection of proven facts, but is "created" from the detective work of historians examining evidence from the past. Providing the interactive environment that only an integrated solution can provide, Experience History gives students the opportunity to examine primary sources and explore specific periods and events. This leads to greater understanding as well as the building and practicing of critical thinking skills. As students uniquely experience American History, Experience History propels students to greater understanding while achieving greater course success. Give students an experience. Improve course participation and performance. Experience History and experience success.